The steel was procured by Sinn from a steel supplier to Emden GmbH, one of Germanys North Sea shipbuilding yards who construct submarines from the very same steel. This special steel is also amagnetic which means that is does not have magnetic properties and cannot itself become magnetized. The watch movement itself is protected from magnetic fields up to 4,800 A/m. This watch is designed for operation in extreme temperature variations - it operates in temperatures between -20 Celsius to +60 Celsius. The movement is water resistant to 5,000 meters, and the case is pressure tested to a diving depth of 12,000 meters as certified by Germanischer Lloyd in Hamburg. "A Flieger Watch in Disguise?" Verified Owner Comments: First comment: when the watch arrives and you take it out of the box, does it cast the same spell over you at that moment as it did when you saw it at the website? Second comment: A week later, in spare moments, do you still find yourself staring at this beautiful piece of craftsmanship and grinning uncontrollably? Third comment: After a month, does a glance at this beautiful piece of craftsmanship still bring a smile to your lips? If so, odds are, you purchased a Sinn UX EZM 2 B GSG9 from WatchBuys. Oh...about the Flieger reference? Flieger watches are my preference, but over the years, I noticed that most seem designed in the black background-light colored numbers style on the rotating bezel. In contrast, similar divers-style watches use the darker numbers on a lighter background approach and to me this keeps the information on the bezel from distracting from the beauty of the dial work. Just personal preference. Verified Owner Comments: After a visit to Sinn factory in Frankfurt last year, I had to have this watch. 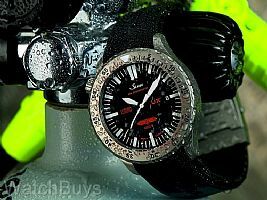 Great for one-up when comparing seck diver watches, but not something I'd dive with. After all, who needs a watch that will work at 5,000 meters anyway? Verified Owner Comments: Tough solidity, super accuracy, excellent readability and practicality - the main essential features of a good diver's watch. Sinn UX GSG9 truly delivers or to certain extend exceeding. Not only you get this fine timepiece at a very reasonable price, you will also get superb CS from WatchBuys. This is hard to beat. Verified Owner Comments: This is the strongest watch I ever had. So reliable and so strong, it's amazing,... I have been looking for this type of watch for a long time. Verified Owner Comments: Although it has a relatively large case compared to many other upscale watches, this watch is not quite as flashy. Yet, its appearance is sophisticated and very well-rounded. Nothing appears to be out of place on this timepiece. It has a very solid appearance and very high level of build quality. It is the most accurate timekeeping device I know of besides something consistently in sync with a time server/atomic signal. Verified Owner Comments: Totally in love the EZM series, and the UX GSG9 version is simply a must have. The next logical step to the EZM2 GSG9 version. "SINN UX (GSG9) Rubber Strap"
Verified Owner Comments: This is one of the most impressive timepiece i have in my collection so far in terms of technology. Built quality is first class. Very solid. This is the only quartz movement i have in my collections (2 APRO, 3 APROO, PP, GP, 2 ROLEX GMT, EXP I, EXP II, YMaster, Datejust, 2 DayDate and etc)..
At this price, this is for sure one of the best buy. I highly recommend it!